There are so many historic venues in Charleston, Sc, all so unique different in their own style. Just down on Meeting Street next to The Mills House, and very close to the four corners of the law is Hibernian Hall constructed in 1840 a historic and exquisite venue, with six giant-order Ionic columns, first floor for a meeting space and the second floor with a beautiful ballroom. This is one of Charleston most rented venue all year long. You can do so much with this venue as you have a church, cobblestone street, amazing buildings, and the venue itself upstair has great window light. Many weddings are held at Hibernian Hall.For this image I decided to photograph this amazing engagement ring, by using the proper light, and the perfect background, with the green pop to it. I changed my angle from the left to the right, witch in this case worked perfectly for this image. The negative space bring your eyes to the halo in the background. 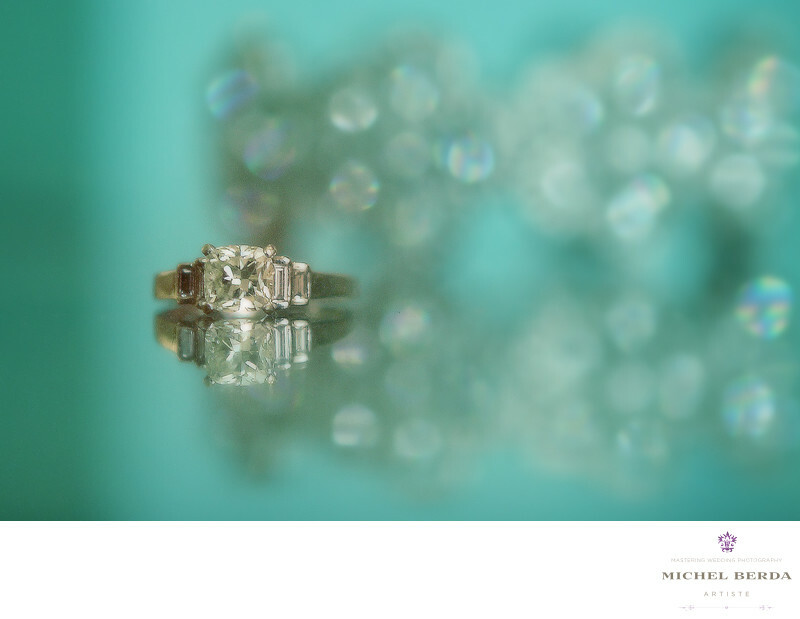 This image of this engagement ring is exactly what I wanted the result to be perfect, and just one of the many images my clients loved from their day, at the beautiful Hibernian Hall.Keywords: Charleston Hibernian Hall (3).